For anyone of you who deals with pics often, here is something to cheer about. Another freebie. This time from COREL that eenables you to download Corel Paint Shop Pro X for free. 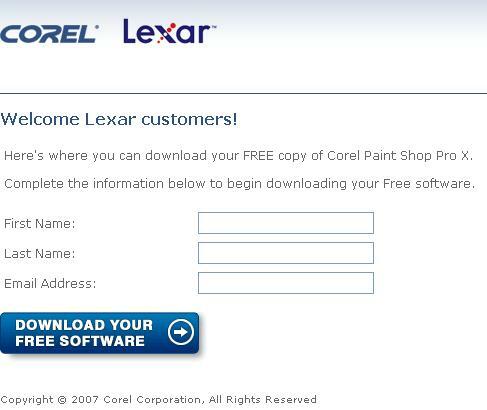 This Promotional offer is Set by Lexar for itâ€™s customers (although any one can get this), where it is giving out all full version ofÂ Corel Paint Shop Pro X (v10.10) for all users. This digital photography toolkit is the ideal choice for any aspiring photographer, making it easy to process, edit, enhance and create professional-quality photos.Â Get creative with artistic effects and filters. Plus, explore a full range of advanced editing tools to get the exact look you want. Once you’ve created the perfect photo, choose from a variety of fun projects to share them with family & friends. Visit this lexar Promotional page and click â€œFree Download Now â€ button. Install itÂ there is no serial number or activation required! It is a standalone copy which you can use forever.